I am always so amazed and inspired by the swap cards I get at convention. From the cards that make you go “WOW!” to the cards that are so simple to make that I realize you don’t have to go over the top to make a striking card. I started taking pictures of some of the cards I received so I can share them with you. So, expect to see more pop up on my blog. For today, I wanted to share a couple cards that I thought were just fun and creative. I saw the a la carte stamp S.W.A.K. when the catalog first came out but I had no idea how I would use it. Well now I do! What is hard to see in the picture but looks awesome in person is that the dotted background looks to be a piece of designer series paper behind a square of vellum – all attached together with silver mini brads. Then she heat embossed with the Melon Mambo embossing powder the lips on top of the vellum. Isn’t it cute?! Isn’t this creativity with punches is inspiring! They sponged some vellum paper with Marina Mist ink and then punched out 5 of the larger petals from the Blossom Petals punch. Then they punched out 5 of the leaves from the same punch on unsponged vellum. 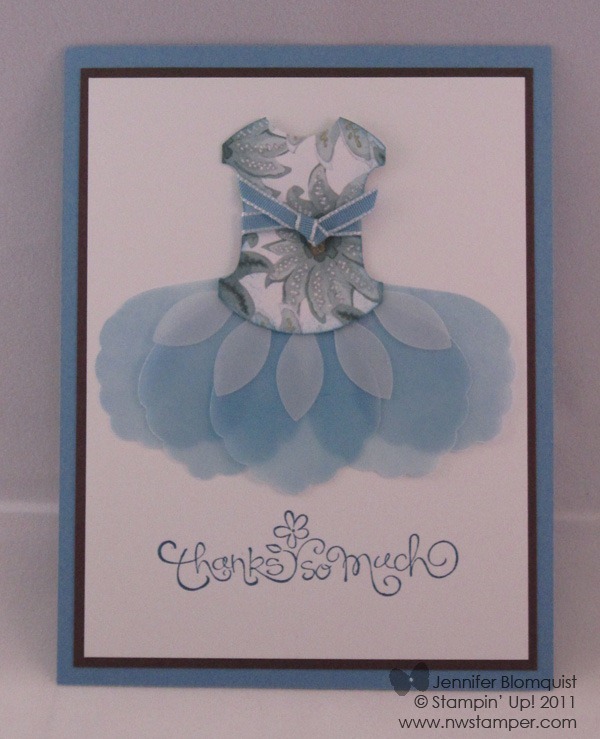 Add a Round Tab punch for the top (with a 3/4” circle punched out to make the neck) and you have an adorable dress card! I think I need to start using more vellum ‘cause I just love how it is used in these cards! Well, these cards inspired me and I hope they inspired you. Shop now and start earning your free stamps with NW Stamper rewards!